"Our patented motor delivers up to 93% efficiency, compared to a maximum of 60% in our competitor's products. Our motor offer you a longer distance range without recharging batteries and increases battery lifetime and meet the needs in sailboats up to 40 feet long." 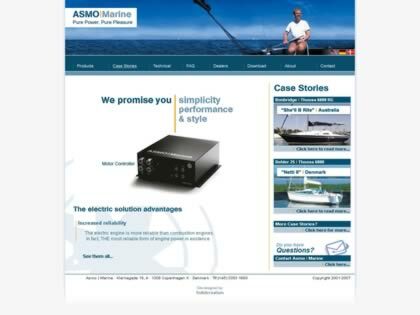 Web Site Snapshot: If available, above is a snapshot of the Asmo Marine web site at http://www.asmomarine.com as it appeared when this site was added to the directory or last verified. Please Note that Boat Design Net has no involvement with the above web site; all content and images depicted in the above thumbnail are the property and copyright of Asmo Marine unless otherwise noted on that site. Description: "Our patented motor delivers up to 93% efficiency, compared to a maximum of 60% in our competitor's products. Our motor offer you a longer distance range without recharging batteries and increases battery lifetime and meet the needs in sailboats up to 40 feet long."